The Colour Me…! Colour challenge this week was to incorporate three colours into a new project: crisp cantaloupe, calypso coral, and lost lagoon. 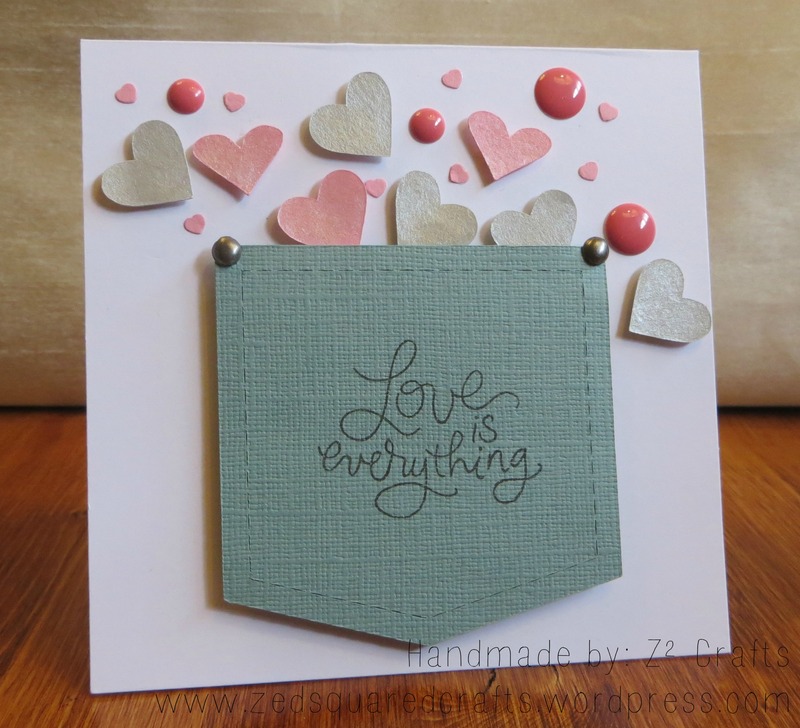 Since I don’t own much from Stampin’ Up!, for me this translated to two shades of pink, and a dusty teal colour. The pocket and large hearts were cut from my Silhouette machine. I used a punch from my craftbox (a childhood relic) to punch the tiny hearts. To bring in the second pink I grabbed some darker pink enamel dots from My Mind’s Eye . I stamped the pocket with a sentiment from the Simon Says Stamp Favorite Flowers set (I love this set!). To finish the pocket I used two 3/16″ brads. I adhered the pocket to my 4×4″ white cardbase using two layers of foam tape and the larger hearts using one layer of foam. Next, I stuck my enamel dots in place and used tweezers and some Tombow Mono liquid glue to adhere the tiny hearts directly onto the cardbase. The card seemed a little too plain so I used a paintbrush to brush on a light coating of Ranger white opal liquid pearls to the larger hearts to add some iridescent shine. Thanks for stopping by! I’ve been having so much fun playing along with the Colour Me…! Challenge Blog.